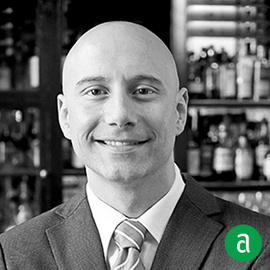 Sabato Sagaria, Master Sommelier and President of bartaco in New York, shares his career timeline and advice for up-and-coming talent. Do as many different things as you can at every roof you work under. Great leaders have walked in the shoes of people they lead. Soak it all in! Ask a lot of questions and diversify yourself through your experiences, but not at the expense of loyalty. It is an extremely small world we work and play in. You are always interviewing for your next job and you never know who is watching. Be organized and focused on your goal. Be selfless with your knowledge (not selfish). It's not supposed to be easy. In my first managerial role I quickly realized that no one works for me, we all work together. That still holds true today. The best sommeliers I have worked with touch all aspects of the restaurant. They have an understanding of finances and managing and motivating people. Rod Stoner former Vice President of F&B at The Greenbrier, taught me to care for and connect with your employees and how to invest in future leaders. Peter Timmins CMC, now at The Everglades Club, taught me how a professional kitchen should be run and to surround yourself with the best. Jay Fletcher MS taught me about overcoming obstacles and the importance of paying it forward to help others grow and chase their dreams. It’s about our employees and our guests, not about us. Take care of them and they will take care of you. Work for and seek out great teachers that inspire you and those that you aspire to be based on how they interact with others. The mentees I work with all have a thirst for knowledge, play well with others, ask questions, have an inspiring work ethic and a great outlook on life.